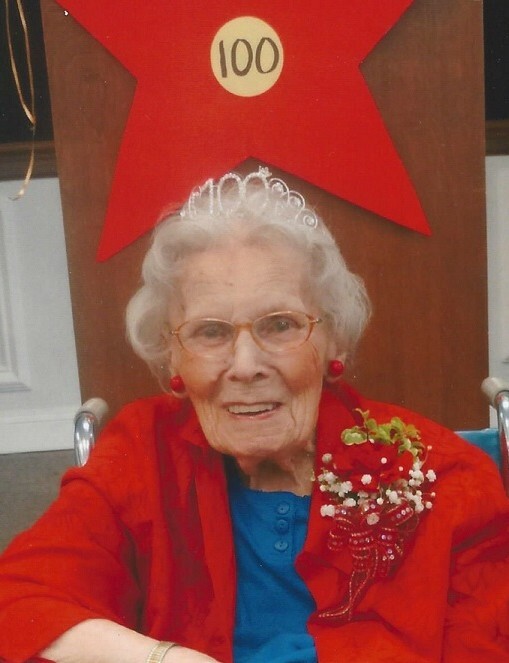 Geneva Barfield Rose, 100, of Wilson, died peacefully at home on January 25, 2019. Funeral, Tuesday, 11:00 AM, Forest Hills Baptist Church. The visitation will be 10:00 - 10:45 AM. Interment will be in Evergreen Memorial Park. She was born Nancy Geneva Barfield on July 19, 1918 to Nancy Craft and Abner C. Barfield in Greene County, NC, the third of eight children. She grew up in Wilson County and graduated from Rock Ridge HS in 1936. After marrying the love of her life in 1942, Geneva was a devoted military wife and together they proudly raised two successful sons. After numerous military assignments, Geneva and Charles Sr. retired in Wilson in 1963. Geneva was a devout Christian and member of the former Five Points Missionary Baptist Church, currently Forest Hills Baptist Church. She enjoyed working with the Girls Auxiliary and always referred to them as her GAs, as they remained special to her. Geneva taught Sunday school through the years, served in the flower ministry until "retiring" in her 90's and drove herself to church on Sundays until less than three weeks before her passing. In all her years of driving, Geneva never had an accident or even a speeding ticket. Geneva enjoyed cooking, baking, sewing, quilting, crocheting and gardening. Her cookies and brownies were world-famous, as are her beautifully crocheted tea towels, cherished gifts for so many. Geneva's sense of humor was unparalleled, making others laugh even through difficult times. Her faith was unwavering and inspiring. She did not judge others, as she believed we are all God's children. Geneva so loved her country and often wore red, white and blue, though her favorite color, red, was prominent in her wardrobe. She had an incredible memory, which earned her role as family historian. She was matriarch of her extended family and loved keeping in touch with everyone. Friends and family could count on remaining in contact for a lifetime, regardless of distance, as Geneva was an avid letter writer and known to talk on the phone for as long as anyone was willing. Her daily journals have documented her amazing century of life and love, forever preserved for her beloved family. Geneva is preceded in death by her loving husband of 63 years, Charles M. Rose, Sr.; parents; siblings, Joseph "Clifton" Barfield, Hattie Mae Summerlin, Mildred Stott, Margaret Cooper, Abner C. Barfield Jr., Jimmie Barfield and Dennis Barfield. She is survived by her loving sons, Charles M. Rose Jr. (Pauline) of Springfield, VA and Meredith Randall Rose (Julia) of Billericay, Essex, England; five grandchildren, four great grandchildren, two great-great grandchildren and many cherished nieces and nephews. In lieu of flowers, memorials may be directed to Forest Hills Baptist Church, 1407 Forest Hills Rd NW, Wilson, NC 27896.